Over the years our company services have grown along with our appetite to keep our clients pleased. This is the crux of our business. Two Foot Ten Foot offers design and consultant services to architects and interior designers. We’ve worked with some of the most renowned architects in the world such as Robert A.M. Stern Architects, and Mack Scogan Merrill Elam Architects aiding in the layout of the fireplaces during the design phases of the project. We can be a great resource at this stage to set the fireplaces up for success. A fireplace that drafts well and does not spill smoke into the room starts with laying out the major components of the fireplace early on. We work within the architects vision for the building and make not only traditional fireplace shapes function properly, but work with odd shapes, tight spaces, and innovative materials to make almost anything the architect envisions function and look beautiful. We can suggest flue sizes and routing by marking up existing drawings, or design and document the full fireplace details. Two Foot Ten Foot can provide full construction drawings to architects which can be included in their pricing and construction sets in whatever format suits the project. Complex flue routing can be achieved by careful analysis of the new or existing structure and mapping a flue route in close consultation with the architect. 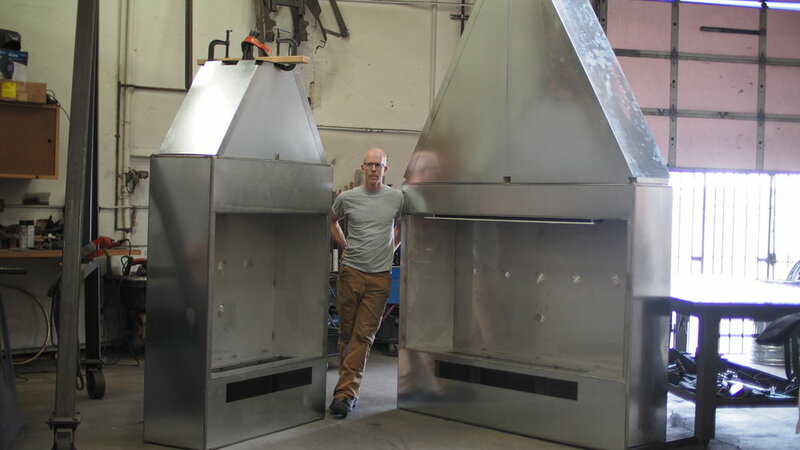 Two Foot Ten Foot designs and fabricates many different components that go into a functioning fireplace. We have extensive experience in crafting beautiful custom gas log sets, as well as more modern linear burners using many different types of burn media. We also design and fabricate many fireplace components hidden inside the fireplace that aid in the draft of smoke up and out of the building. We also provide to contractors and owners full install services of many of the assemblies we create and sell. In many cases we will ship our components to the job site where our install team will assemble and test the systems to our exacting standards. We work alongside other subcontractors to work within the time constraints of building construction. We can provide full commissioning services for many of the components we sell to ensure the fireplace is functioning safely and as intended. Some fireplaces, just don’t function well. We work with owners to find solutions to these problems and can recommend an supply fixes for these troublesome fireplaces.